Congratulations to the new Citizen Foresters who attended our free Trees 101 class on Saturday! 25 participants from the District and Maryland came out to our headquarters on Saturday morning for the introductory class. Attendees enjoyed a light breakfast while they learned about Casey Trees, the urban forest, tree anatomy, tree functions, and basic tree identification. During the last hour of Trees 101, instructors Priscilla Bocskor, Shawn Walker and Katie Heffernan led the class on a tree walk around the area. Participants enjoyed the beautiful weather and practiced their tree identification skills during the walk. A contest was held at the end of the morning for attendees to guess the diameter of a large basswood (Tilia americana) in the neighborhood. Winners received free Casey Trees t-shirts. Tree walk outside the Casey Trees headquarters. 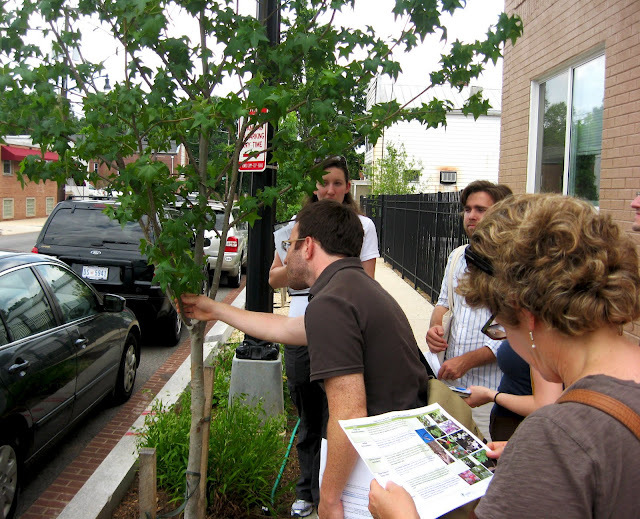 Interested in learning more about the District's trees? Check out our calendar for upcoming summer events, including a Tree Walk at Tudor Place on July 23.